Wednesday, March 27, 2019 – H-E-B Center at Cedar Park, Austin, Tex. 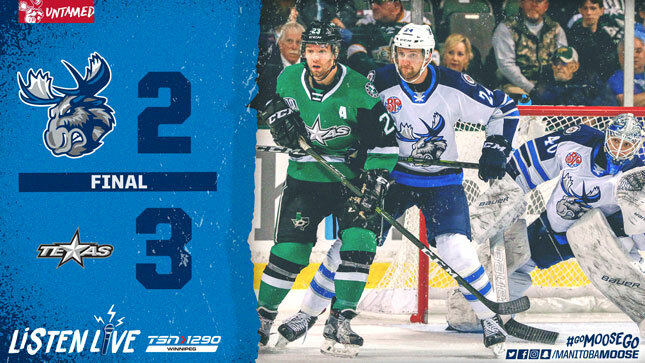 The Manitoba Moose (33-28-4-2) three-game win streak ended Wednesday night at the H-E-B Center against the Texas Stars (33-29-4-3). Texas opened the scoring at 8:05 of the first when Joel Hanley picked up a stray pass and squeezed it through Mikhail Berdin’s pads with a backhand. Texas nearly doubled their lead five minutes later, when the Stars’ forecheck stole a puck from Berdin behind the net and sent it out front. The Moose rookie goaltender recovered spectacularly, gloving the puck down and securing a stoppage. After 20 minutes, the Stars led Manitoba 1-0 on the scoreboard and 12-7 on the shot clock. Texas started the second quickly, outshooting the Moose 4-0 in the first four minutes of the middle frame. Manitoba bounced back, tying the game at 7:30 of the second when Marko Dano found space in the neutral zone, walked in, and snuck one five-hole on Bow. The Moose kept pressure on Texas, utilizing a late power play to outshoot the Stars 14-10 in the period, but couldn’t find their first lead of the night. That lead came 5:14 into the final frame, when Jansen Harkins corralled a bouncing puck before finding Seth Griffith on the backside, waiting to tap it home. The lead was short-lived, however, as coincidental minors gave way to 4-on-4 action. Texas took advantage of the extra space, and at 8:46 of the third, Michael Mersch rifled home his 21st of the season, unassisted. Just 34 seconds later Eric Condra sprung Dillon Heatherington on a breakaway. Heatherington put the Stars ahead for good, despite some late pressure from the Moose. Berdin made 29 stops in the 3-2 loss. Marko Dano scored on Texas for the third-straight meeting, and totalled nine points (5G, 4A) in the season series. Seth Griffith is on a three-game point streak (1G, 2A). Berdin has faced 32 or more shots in his last five starts (3-2-1). The Moose wrap up the road trip with back-to-back games against San Antonio on Friday and Saturday. Both games will be broadcast on moosehockey.com/listenlive, the Moose App and streaming live on AHLTV. Additionally, Friday’s 7:30 p.m. CT puck drop will be available on TSN 1290.